With Spanish-speaking friends and relatives, we thought it important for our kids to learn this important language. Spanish for Children with its wonderful, classical approach to teaching Spanish has proven to be a real blessing for my daughters. I do not know how to speak Spanish, so I am learning it with my kids in a co-op setting. Our Spanish teacher, a dear friend of mine, checked out this program and really loved it. Designed for grades four and up. Pronunciation will become a breeze and don’t be surprised to hear even your youngest children picking up the catchy chants and songs. Each lesson (average length 15 minutes), corresponds to the weekly chapter in the Spanish for Children Primer A book, and features Julia and her students chanting their weekly grammar charts and vocabulary, with corresponding visual images of the words. Following the vocabulary lesson, Julia Kraut carefully and thoroughly explains Spanish grammar, with the goal of teaching students to create their own sentences, and express exactly what they need to say, rather than simply mimicking common phrases. The text from the book appears on the screen as the material is presented, making it easy to follow along. The audio Chant CD (take it anywhere you go!) includes grammar chart chants and complete vocabulary. The entire set includes 4 DVDs and 1 CD. Spanish is one of the most valuable spoken languages for North American students to fluently learn. There is a distinction, however, between just learning common words and phrases, which is the approach of many Spanish programs, and knowing the language well enough to communicate fluently and accurately. Spanish for Children teaches elementary students this dynamic language, both classically and creatively, in grades four and up, when as children, students soak up learning language like a sponge. Spanish for Children Primer B is the second text in the series, and emphasizes grammar and the parts of speech as vital tools for correctly speaking and understanding Spanish, along with expanded dialogs, stories songs, and chants. 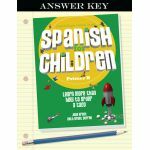 This is the answer key for Spanish for Children Primer B. Homeschooling parents, especially those who are learning Spanish alongside their students, will find this answer key particularly useful. It includes the worksheets and quizzes from the Primer with the answers in a large bold font. Imagine having an energetic and passionate Spanish teacher walk right into your home and sit down to teach your students. That can virtually happen when children learn with Spanish for Children author Julia Kraut on the corresponding Spanish for Children Primer B DVD and Chant CD Set.